I wasn’t sure what to expect when Futureville: Discover Your Purpose for Today by Reimagining Tomorrow arrived at my door. What I found was a collection of thought-provoking ideas buried behind a mediocre title. So I’ll start by saying: this is a really interesting book, and well worth the read. Author Skye Jethani begins by describing how the exhibits from the 1939 World’s Fair helped people envision a future that was brighter than the grim circumstances of their present. How we think about the future, he says, and what/who shapes that vision, influences how we experience and respond to the present. Think about that: Who and/or what shapes your vision of the future? How is that influencing how you see and respond to the present? It’s an interesting question. My favorite chapter in this book is the one on the role of beauty in fighting evil. I don’t spend a lot of time thinking about beauty as a tangible pursuit or a philosophical construct, although I like sparkle and pretty things as much as the next girl. So I was surprised by how much underlining I did in this part of the book. For example, Jethani describes how, “The Christian artist is engaged in a subtle but powerful defiance…. refusing to submit to the ugliness of the world, and in her cultivation of beauty she is creating an oasis for others fleeing the darkness.” Then he gives examples from the Bible and from present day life of what this looks like and how it works. If that doesn’t give you hope that your artistic ventures are worthwhile, what will? Overall, this is an interesting, hope-filled book filled with ideas that would make for GREAT dinner party conversation. 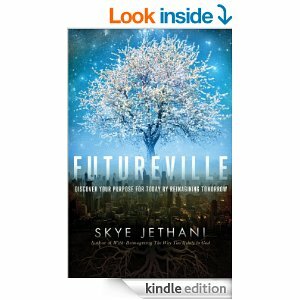 This entry was posted in Books and tagged Book Reviews, Futureville, Skye Jethani on February 3, 2014 by Trish Ryan.